New York City Mayor Michael Bloomberg, shown here during his September 11 tenth anniversary address, fears that joblessness could lead to riots. NEW YORK (CNNMoney) -- New York City Mayor Michael Bloomberg is worried that high U.S. unemployment could lead to the same kind of riots here that have swept through Europe and North Africa. "You have a lot of kids graduating college, [who] can't find jobs," said Bloomberg, during his weekly radio show on Friday. "That's what happened in Cairo. That's what happened in Madrid. You don't want those kinds of riots here." That was the mayor's response when asked about the poverty rate, which rose to 15.1% in 2010, its highest level since 1993, according to census data released Tuesday. About 46.2 million people are now living in poverty, 2.6 million more than last year. "The public is not happy," he said. "The public knows there is something wrong in this country, and there is. The bottom line is that they're upset." Riots have gripped various countries in European cities, including Athens and London, fueled by young people infuriated by high unemployment and austerity measures, which in some cases has led to looting. High unemployment among youth is also one of the driving forces behind the Arab Spring, as impoverished protestors in North Africa and the Middle East rose up against their heavy-handed governments. 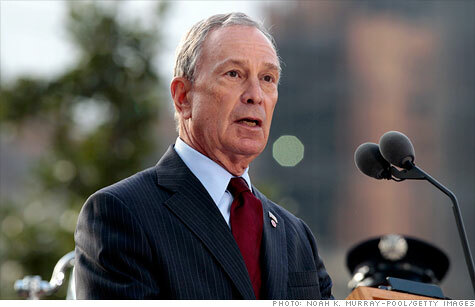 "The damage to a generation that can't find jobs will go on for many, many years," said Bloomberg. The mayor, an independent, criticized the partisan politics that have stymied progress in Congress, and the inability of Republicans and Democrats to compromise on ways to fix the economy. "There is no overnight solution," he said. "You look at the president's proposals. At least he's got some ideas on the table, whether you like those or not." "The only way you solve this problems is that everybody pays a little more and everybody gets a little less," he added. The economy added no jobs in August, according to the Labor Department, for the first time since February, 1945. The unemployment rate is 9.1%, but many experts say that figure is misleading. They prefer to use the so-called underemployment rate, which includes people who have given up their search for jobs as well as people who want to work full-time but are forced to work part-time. The underemployment rate is 16.2%.